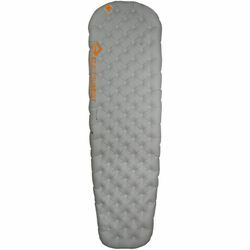 Sea to Summit Ether Light XT Insulated Sleeping Mat. The new Ether Light XT Insulated Air Sleeping Mat brings Air Sprung Cell™ comfort to the realm of thicker air sleeping mats. Quiet and lightweight, this sleeping mat uses two types of insulation to provide three-season warmth. IS THIS AIR SLEEPING MAT…? Warm enough for shoulder seasons? Yes. This air sleeping mat has a tested R-Value of 3.8 – perfect for conditions from Spring through Fall. Comfort & Support - 4 inches of plush support offers luxurious comfort and you won't feel the uneven ground beneath you.